Chances are that if your business uses Microsoft Office 365, you also have access to Forms and Teams. 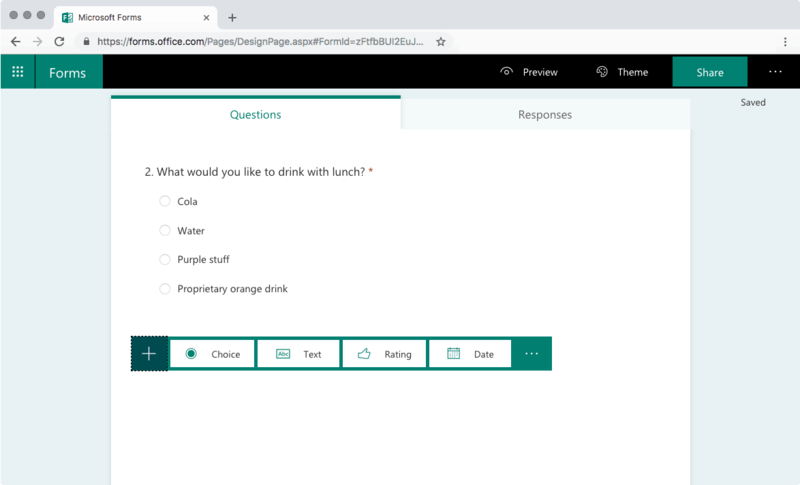 Microsoft Forms is an online form and quiz builder that can be used to collect information from both your organization and external users. 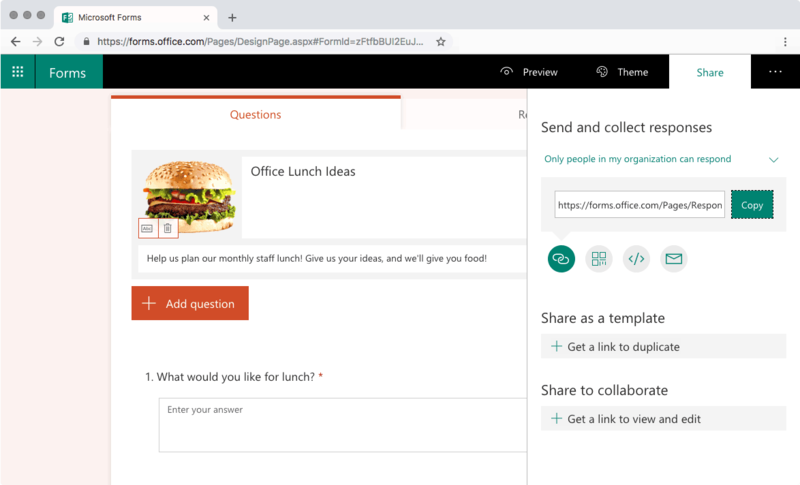 Teams is Microsoft’s chat and collaboration platform, and in many cases is an ideal way to make forms available to staff. Let’s create an example form that we’ll integrate with a channel in Teams. 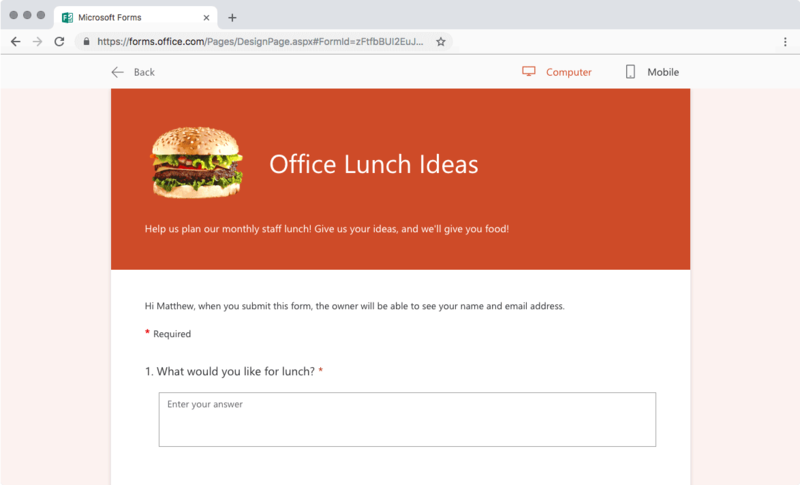 While there are many applications for a form within a business, we’ll keep things lite and create an “Office Lunch Ideas” form. 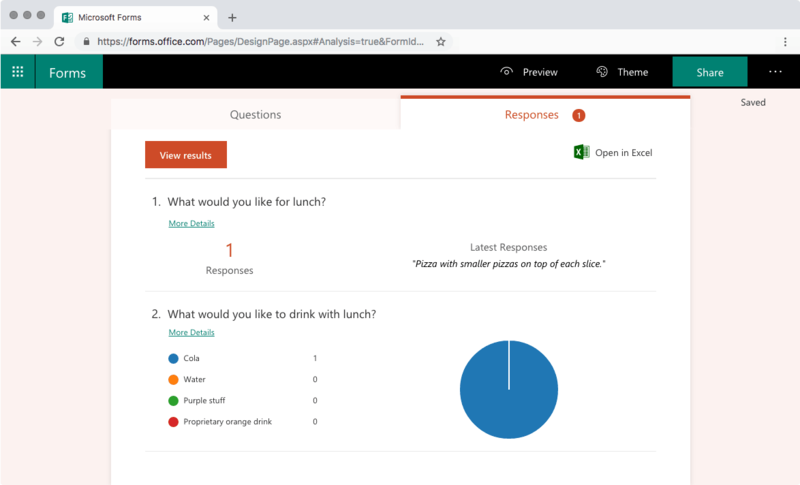 Microsoft Forms provides a variety of controls to help you best ask questions in a way that will provide you with responses that can be measured as you see fit. It’s a bit boring, but Forms includes themes and the ability to add an image to spice things up! 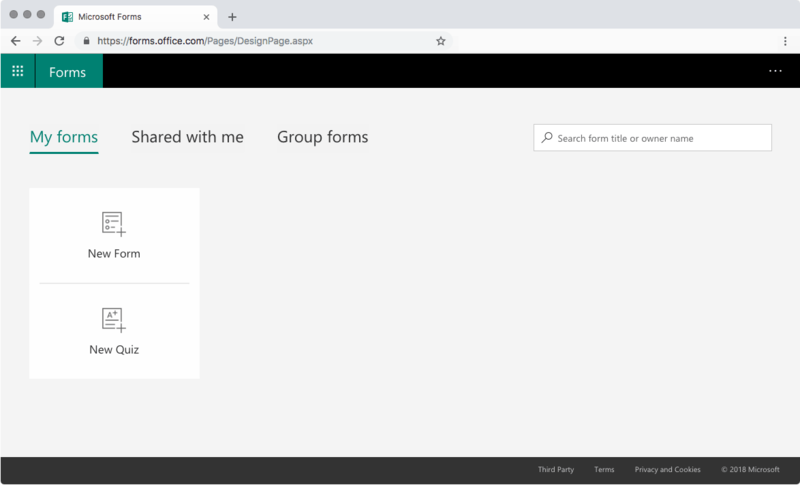 You can select a theme for your form by clicking on the “Theme” link at the top of the page and adding an image is as easy as clicking the image icon to the right of the form title. You can upload an image of your own or search Bing to easily find an image that works with your form. While this form could be sent out via an email, we use Teams heavily throughout the day and will receive a larger response by placing in a frequently trafficked area. You also have the option of collecting the responses or making them available for everyone to view. For the purpose of this demo I’m going to collect the responses so we can review them later. The responses tab provides quite a bit of information on form activity. It displays the number of responses, the average time it takes to complete the form, the form’s current status, and lists all responses. You also have the ability to export the responses to an Excel spreadsheet for further analysis. 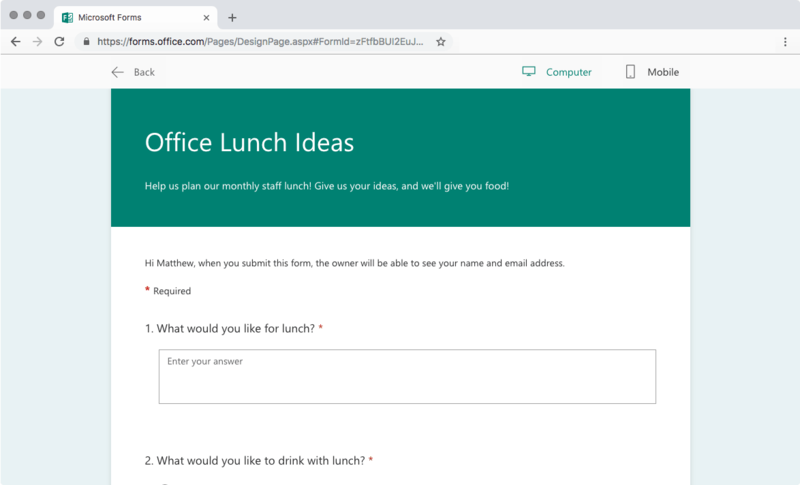 Forms is of Office365’s lesser known tools, and when used correctly can provide you with a wealth of insight to base decisions on. 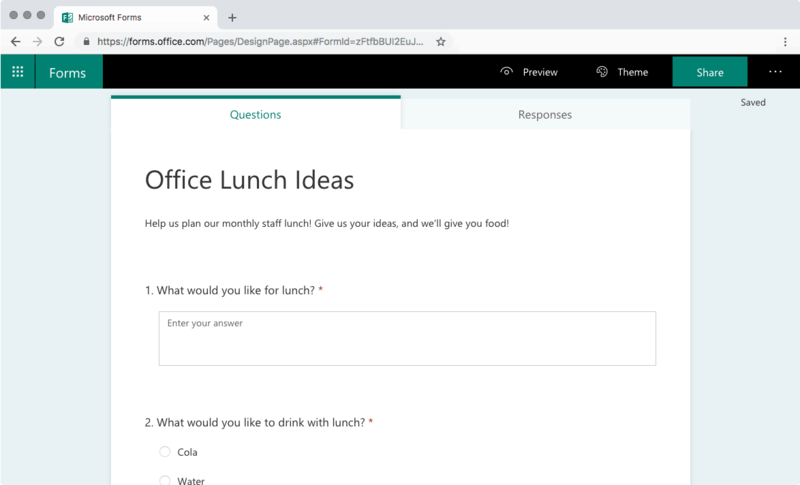 Its ease of integration with Microsoft Teams makes collecting internal information easy and fits in to the collaborative nature of the platform effortlessly. 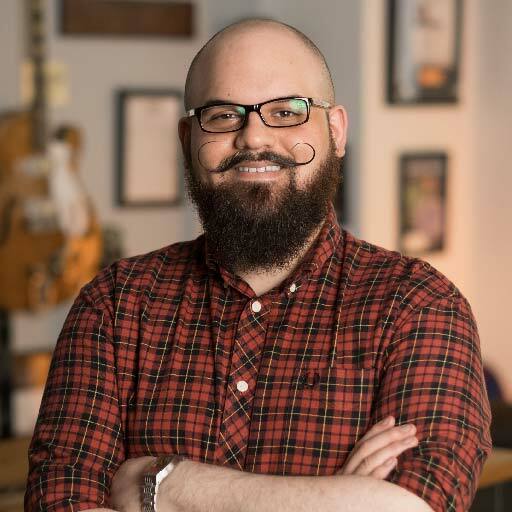 Interested in learning more about Microsoft Teams? Download our Microsoft Teams Power User Guide and Cheat Sheets today!